The story of Time is one that you’d expect to hear on stage at WWDC: two teenage developers, Shaan Singh (17) and Erik van Der Plas (15), create an app to help you be more productive. It’s upvoted on Product Hunt almost 650 times in two days and climbs the productivity charts in the App Store. But what is Time, and what do two teenagers know about being productive in your work? Right away, you’ll notice that as a task manager, Time isn’t nearly as complex as other options in the App Store. It’s a simple list of your tasks and the amount of time you’ve assigned to them, noticeably devoid of projects, contexts, or notes. Adding a new task is the most visible action you can take in Time, one that requires a quick set of taps and labeling. The point of Time, however, is not to help you manage your life; instead, it wants to help you start and finish tasks as quickly as possible. To do this, Time starts a running clock once you tap to begin a task. As the time ticks down, “liquid” leaves the container in the background, changing color from green, to yellow, to red as you get closer to the time limit. Don’t finish the task in time and you’ll see the timer go up and stay red, signaling that you’re working in the overtime period. The ideal use of this, Singh explained in the Product Hunt post’s comments, is as a glanceable indication of how much longer you have to work. Instead of having to focus on a number, you can look over, see a slightly yellow color, and know that you still have some time remaining. In practice, this works exceptionally well; while writing this article, I glanced at my time limit out of the corner of my eye, not focusing on the number but the color. Some situations may require you to add or reduce the amount of time you work on a task. Time makes this really easy by using gestures – move your finger up or down on the timer to change the allotted time. 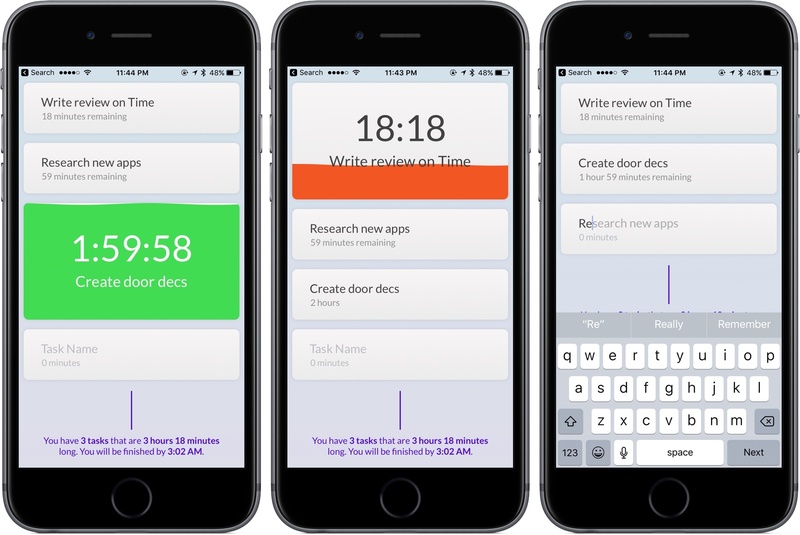 At the very bottom of the task list is the total number of tasks and time it’ll take to finish your work, along with an updating clock that will show you the estimated time of completing all your tasks. To help you work better, Time’s artificial intelligence learns your work habits and offers suggestions based on the time of day and the length of the task. For example, Time may encourage you to extend the time limit on a certain task that you’re not productive on or work on something at a different time of the day. In my usage of Time, I haven’t seen this option displayed on any of my tasks. I’m not quite sure how long it takes to display, but I imagine that the app takes quite a bit of time before it knows your habits enough to suggest alternatives. For your more repetitive tasks, Time will offer autocomplete suggestions based on what you’ve typed before. For my smaller, more immediate tasks, Time is looking like my next go-to productivity tool. I love having the ability to dump small tasks and work on them individually, watching my progress continue as the timer counts down. Through using Time, I’ve seen myself become more motivated and encouraged to get stuff done. For a 1.0 product, Time nails its goals and looks good while doing it. While it isn’t for the task manager power users, those looking for motivational new ways to get tasks completed should look into Time. You can pick up Time for $0.99 on the App Store for iPhone.